Sometimes I sit here, trying to think of what to write, how I want to sound, what this blog should be, and wonder why I even bother with it. It's by no means a great blog, I do not get a ton of views, and comments are few and far between. I don't know what I'm doing. There is so much I just don't get about this world, about social media. It seems mind boggling to me to see so much sub-par content get a wild amount of attention. Take the "popular page" on instagram for example. A gorgeous photograph of breaking waves is understandable, but a poorly lit ploy for attention or bottle of nail polish? It makes so little sense. I blog because for some weird reason, I like it. Though most of the time it seems that no one is reading, I like sharing some of the things I love, little weekend trips, favorite recipes, etc. It also allows me to remember things I might otherwise forget. It's a creative outlet, though there hasn't been much of that as of late. Maybe one day I'll hit that magic stride, maybe not. Speaking of nail polish, I have been on the search for a shade that apparently does not exist. From the names of the almost, not quite there shades, it would be called dusty bubblegum barbie pink. It sounds disgusting. 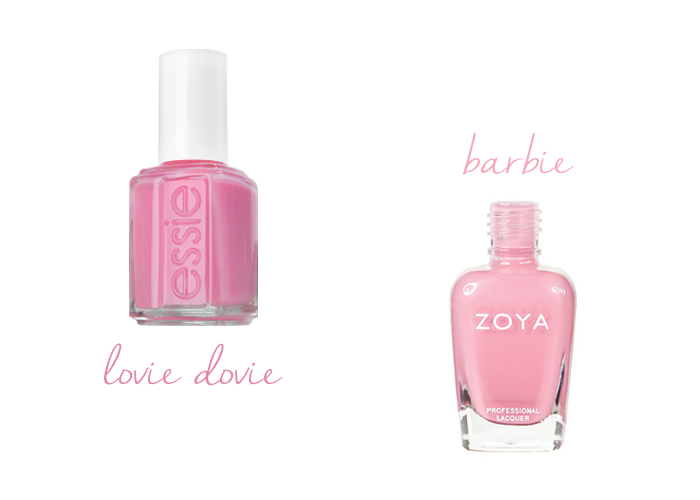 Essie's "Lovie Dovie" and Zoya's "Barbie". If you know the shade I'm looking for, please share! okay i think i have two suggestions for you!! not sure exactly what you are looking for but i was also veryyyyy picky about my pinks and i have it down to two all-time favorites now: essie "my better half" and essie "muchi muchi". i think they one you're looking for is my better half but thought i would suggest them both. my better half is what i like to say is the perfect saturated pink without being barbie. it has all the color that a pink polish would have but doesn't look too gaudy or too hot pink or too magenta. you can see it in some of my latest posts, i always link the nail polish i am wearing so try looking and see if that seems right. you might also be able to see it in instagram detail shots (i am @mk_minnis). then muchi muchi is a light pink which i also struggled to find the perfect one. i wanted it to clearly be pink but i didn't want it to be very saturated, i still wanted it to be light but not sheer. this one completely fits the bill. sorry to ramble but i could totally relate, i think it took me two years to find these perfect shades! hopefully one of those works out for you! Thank you so much MK! My better half is actually one of shades I have been looking at/considering! I have this color in my head and it has been ridiculous trying to find it. I like the lovey dovie shade of polish.